When choosing a shed company there are a lot of options out there. Vinyl, Plastic, Metal, Or Wood. We only build wood sheds. Living in New England my whole life I am Influenced by the beauty of the Colonials, Victorians, Capes, and Gambrel style homes. These influences are seen in all of our shed designs. 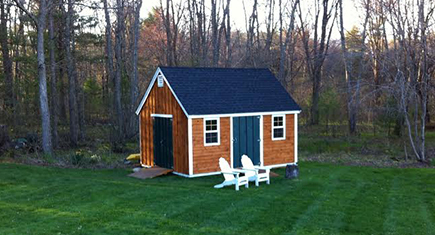 All shed companies have their own building styles. The way they sell their sheds differ from one to another. Here is where Ponderosa Pines is different from the rest. 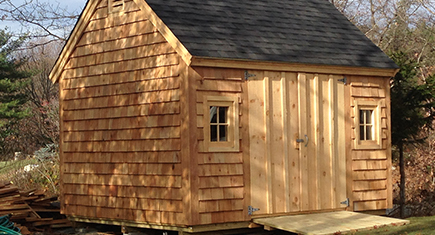 You may request a quote on any of our shed models by calling us at 781.585.4472. For onsite evaluations at your property, we charge a fee of $150 that is deducted from the overall cost of your shed should you purchase. Other companies offer things like Ramps,Boxes and Shutters, 30 Year Arch. roof Shingles, Vents and Pressure Treated 2×6 Floor Joists for extra charges. We include all of these features as standard at NO additional charges for all of our products. We take old fashioned Yankee pride in our workmanship, products, and custom designs. Our products are designed to last a lifetime – not a few seasons. Our goal is to build the most durable and highest quality sheds and utility buildings at the lowest possible price. Our reputation for service, quality, craftsmanship and excellence stands behind every shed we construct. Most of our competitors nail their clapboards just to the studding. We use a full 1 inch underlay board like they used to build quality homes in New England for the last 300 years. There is no skimping on quality here. Every piece of lumber is hand-picked, full dimensional, native pine. 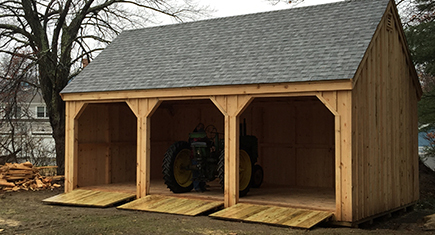 Our sheds are made with post and beam construction for a sturdiness that you can’t find anywhere else. 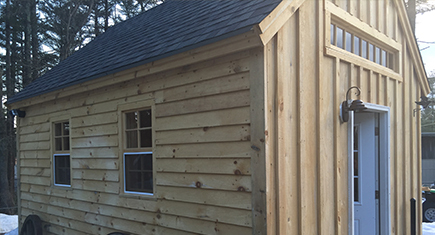 Our floor and roof construction is made with full, one-inch, native pine planking. This is the strongest load bearing support structure in the industry. Our ramps are heavy duty 2 x 6 constructed. We use heavy duty hot dipped galvanized hardware that can withstand years of weathering and will not rust and we use custom made 4 light cellar sash windows and 30-year warranted shingles.